But if you’re gonna have giant car dealerships in the city, then this is about as sensible a location as you could find. It’s practically underneath I-90 and surrounded by industrial uses, some functioning, some defunct. Definitely not an attractive area for housing. A few years ago Urban Visions had plans in the works for a project called Stadium East, consisting of one million square feet of office on the 6.5 acres across Airport Way from the BMW site (see rendering below), but I could find no info on the current status (another one falls into the memory hole?). When BMW Seattle exits, Pike-Pine’s land use diversity will be further diminished, and the neighborhood will lose blue collar jobs. Not to mention that I, along with countless other red-blooded American boy-men, will miss drooling over luxury cars in the heart of Capitol Hill (though we’ll still have Ferraris and Benzes to admire). But from the perspective of overall urban sustainability, I believe it would be best to put the BMW site to a use more in line with a high-density urban neighborhood — and that means housing and retail/commercial. Storing all those cars simply takes too much space. And besides, it makes little sense for car dealership to be located in a neighborhood where the rate of car ownership is about a low as it gets in the entire city. 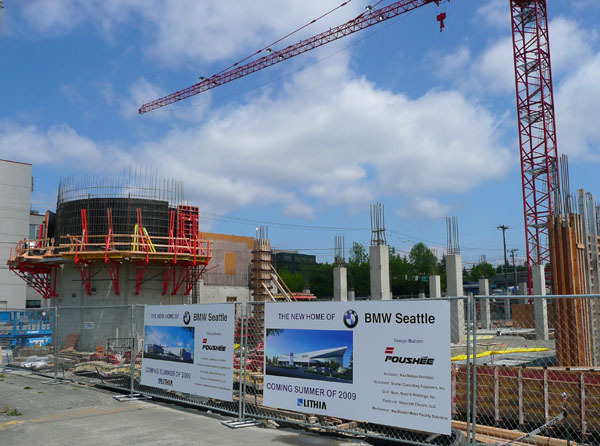 Now that the Seattle housing market is cooling, it will be interesting to see what becomes of the BMW site, especially in light of the stalled status of the condo project across the street on the 500 block of East Pine. 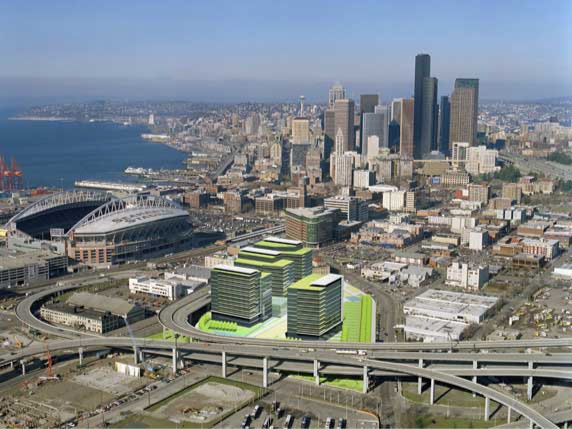 Back in 2006, Pryde Johnson was developing plans for 208-unit condo project on the BMW site. The project made it as far as an early design guidance meeting, at which many concerns were voiced regarding potential noise conflicts with the surrounding nightclubs. Given the neighborhood context and the state of the housing market, adaptive reuse of the BMW buildings would be the way to go. Liz Dunn’s Piston & Ring building on 12th Ave between Pike and Union is the perfect model. Posted by dan bertolet on	Tuesday, May 27th, 2008 at 11:19 pm. You can follow any responses to this entry through the RSS 2.0 feed. You can leave a response, or trackback from your own site. To me, it makes a lot of sense to put office space in that area, instead of residential buildings. When the bars are packed during the evening, the office buildings would be mostly empty. When the bars are more slow-going during the 9-5 hours, the office space would be packed. The bars would get flooded with happy hour traffic, everyone wins. The time slices are so mutually compatible that I could scream! Capitol hill could also use some more office jobs, in my opinion. Most of us (yeah, that includes me) end up commuting downtown or (even worse) the east side. Shouldn’t we spread more 9-5 jobs over the rest of the city? If residential units went up, I don’t think you could avoid noise complaints. Residents who need a sound sleep and party-goers don’t mix well in a tight space. And those Benz/ferrari dealerships are on the border as well. Regarding offices: It would be nice for the neighborhood to have office space there, but I wonder if there’s demand. It seems like a lot of the businesses in Pine/Pike now are low overhead and presumably not interested in newer, more expensive space. Of course, this could be a result of only older space being available — chicken and egg can be hard to distinguish. Mmm, I’m excited to look anywhere other than Lithia’s BMW shops for my next BMW, although I’ve loved BMW Seattle – somehow I’ll bet most of their products will be priced at MSRP with little room, if Lithia’s going to pay off that construction loan plus their new mortgage :-). Thanks for the photos of the project! Pryde is in serious trouble with this site. They acquired most of the parcels but not enough. The parcels purchased resemble a tetris piece. One of the key parcels is an existing apartment which is quite old. Buying it and tearing it down will gain the ire of this blog and other but will be necessary to make it work. The existing bmw site has circulated the market twice in the last 9 months from 2 different brokers. The BMW is amongst the top 3 in the country in terms of sales however. Historically the P/P corridor was where the cars of the city were serviced and I believe the code still states it wants to retain the flavor of historic car fixing areas. If residential units went up, I don’t think you could avoid noise complaints. United States pending home sales elevated in April 2010 beyond expectations as buyers signed contracts to collect a federal tax credit. The National Association of Realtors’ index for pending sales of used homesclimbed by 6.0% to 110.9 in April, the organization said Wednesday. The gain was the third in a row. Economists surveyed by Dow Jones Newswires had expected pending home sales would climb in April by 5.0%. First-time home-buyers raced to beat the April 30 deadline for the tax credit. The incentive was an extension of a subsidy originally enacted in February 2009. Can i make a suggestion? I believe you’ve got something good right here. But suppose you added a couple links to a internet page that backs up what youre declaring? Or perhaps you might give us a little something to take a look at, anything that would associate what you are expressing to something tangible? Just a suggestion. Thanks for the great post. I’m a new BMW owner so I’m trying to learn as much new stuff as I can about my car! Hi! Ive just subscribed to your website! take a look at my page if You are looking for flowers lebanon!